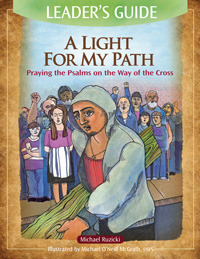 Click here to view a promo video of A Light for My Path. Filled with practical advice for staging, preparing, and rehearsing the service, this leader’s guide also offers tools for spiritual preparation and mystagogical reflection. Materials are included for promoting the service in your parish community through personalized invitations, pre-designed bulletin inserts, and a promotional video for your parish website. For those communities that may be interested in hosting a retreat centered on the Stations of the Cross, the Leader’s Guide offers reflection questions, invitation flyers, and ideas for planning and hospitality. Music ministers will find this resource especially helpful as it includes sheet music for keyboard, guitar, C instrument, cantor, and SAB choir, along with recordings of the music for reference and rehearsal purposes.